My Latest Obsession | it's nail polish, at the moment. The bag itself is clear and made of thick plastic and will join the pile of other makeup bags I’ve gotten free with purchases that I never, ever have a use for. I received travel sizes of All Nighter Makeup Setting Spray and Supercurl Curling Mascara, a mini 24/7 Shadow Pencil in Rehab, a full size Lip Junkie lip gloss in Naked, and of course the ubiquitous sample card of primer potion. The best thing about this for me is the lip gloss – not because it’s full-sized, but because it confirms my suspicion that I need to immediately buy every lip color UD makes in the shade Naked. It’s perfect for me! 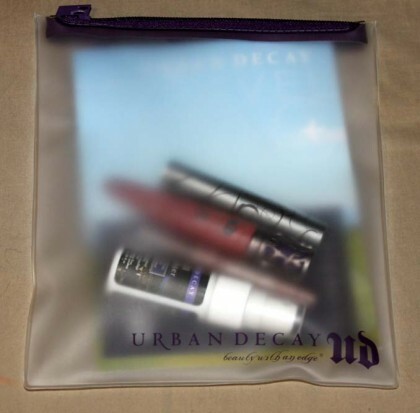 The bag cost $16 and supposedly includes over $45 of Urban Decay products. I can’t speak to that because pricing on travel/sample sizes is always a little shady, no matter the brand, but this is a good buy specifically for the lipgloss I received, which sells for more than the cost of the bag. 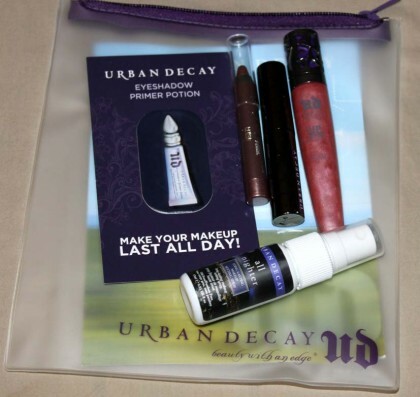 Also included in the box I received were a card with a UD logo sticker and a $5 coupon for my next purchase (not sure if that’s because I bought the travel bag or what? ), and my mystery Early Exclusive Sample. Well, sort of. Neither of these things was actually included in my package. 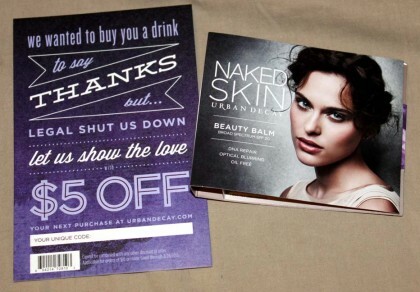 I received a card/wrapper thingy for Naked Skin Beauty Balm, which Iwas SO EXCITED to try…but there was nothing inside the card. Furthermore, the card with the coupon on it has a space for “your unique code,” BUT THERE IS NO CODE. WTF? I’m going to contact UD about it, but I really doubt anything will come of it since I’ve had issues in the past with their customer service. Irritating, since I LOVE both their Naked foundation and their tinted moisturizer, and since I would TOTALLY use the code. *UPDATE*: I emailed UD and got the credit added to my account, and she said she’d try to find another sample for me. So, pretty good! 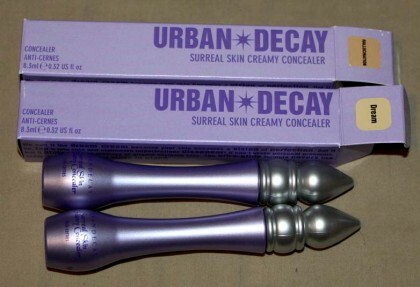 *UPDATE 2*: I just received a package from UD containing a replacement for my sample that was missing. Faith in UD CS is restored! Really awesome, I wasn’t expecting this at all. I also got the two clearance shades of Surreal Skin Creamy Concealer, Dream and Hallucination, which are both EXTRAORDINARILY yellow. Seriously. YELLOW YELLOW YELLOW. Oh, one more thing I wanted to mention – it looks like UD has lowered their free shipping threshold for the holiday season. You now get free shipping at $35 instead of $50. Shipping will be $2.50 for the first polish and $.50 for each additional polish, until you hit flat rate at $5. International is fine, but contact me to figure out shipping and there might be a small shipping delay because I will have to actually go in the post office and wait in line. Email me at mylatestobsession1@gmail.com if you’d like to buy something, and I’ll invoice you. And, $5 minimum, please. I’m happy to take pictures of whatever, just ask. Assume everything’s been used or swatched once unless otherwise stated. Wearing this polish kicked off like 2 weeks straight of absolutely loving every polish I put on my nails. I found this at Ulta on clearance, and I have no idea what collection it’s even from because OPI is one of the few brands that I don’t pay much attention to, but it is gorgeous. 3 coats.